Jeremy Norman, rare book dealer and author of From Gutenberg to the Internet: A Sourcebook on the History of Information Technology, has created the History of Information website. It's full of interesting entries from 2,800,000 BCE to 2015. To get entries specifically about books, choose Book History in themes and then pick a time period. Some of the entries are about specific books; others are more general. 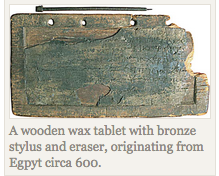 The above picture is from the entry, During the Middle Ages Wax Tablets Are Widely Used (Circa 610). "During the middle ages wax tablets were in general use. Daily life cannot be imagined without them: students were supposed to carry a diptych at their belt for easy use, while writers used them for rough notes. They were also employed in private correspondence. Above all, medieval accounts were kept to a large extent on wax tablets, and most of the surviving examples served this purpose; even books of wax tablets were formed. In some places the use of wax tablets for accounting continued up to the nineteenth century" (Bernhard Bischoff, Latin Palaeography. Antiquity & the Middle Ages  14). Lots and lots to explore.